Welcome back to the Cacique Resort Review in which we offer you a snapshot of our exceptional partner resorts around the beautiful islands of The Bahamas. In this episode, we are exploring the most elevated of the Atlantis brand, The Cove. Combining high design and bare-foot elegance in a private white-sand sanctuary, The Cove Atlantis provides the perfect tropical escape and a unique canvas of bespoke venues for meetings, incentives, conventions and events. THE COVE ATLANTIS | THE WHY? Walking down the Jeffrey-Beers-designed atrium, you feel your shoulders drop as you are drawn towards an azure horizon. It’s a uniquely-glamorous “welcome to The Bahamas” that combines timeless elegance with metropolitan sophistication. Nestled in an intimate white-sand cove, the property is perfectly-removed from the hustle and bustle of the main Atlantis resort, with access to all the facilities, including the legendary waterpark, the world’s largest man-made outdoor marine habitat, the Caribbean’s premier casino and a profusion of dining options & world-class meeting spaces for groups of all sizes. The Jeffrey Beers designed Atrium at The Cove Atlantis. THE COVE ATLANTIS | THE WHAT? The new Cove, which re-opened in November 2017, celebrates a series of design collaborations, dining and guest experiences, each paying homage to Bahamian traditions, culture and cuisine (http://www.insidertravelreport.com). New culinary options include FISH by Master Chef José Andres, and chic Harbour Island transplant Sip Sip by Bahamian Chef Julie Lightbourn, each bringing unique local flavours and island vibes. 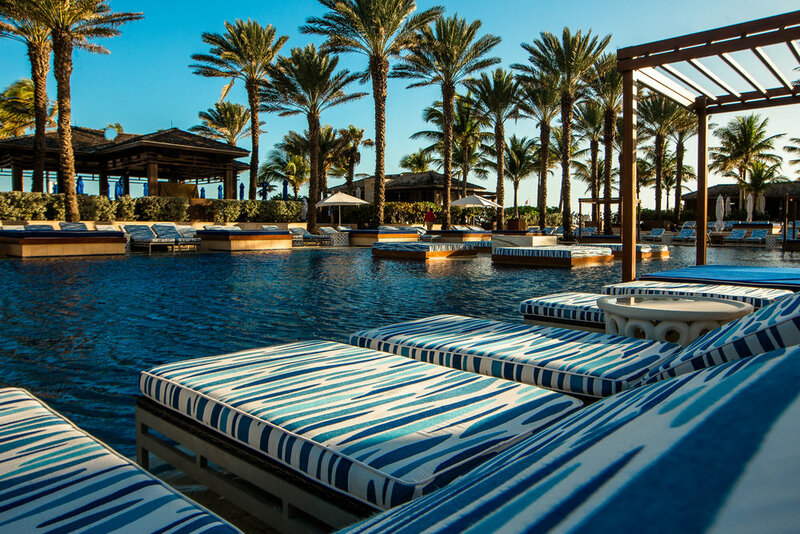 The re-imagined guest experience is centered around a re-designed adult pool scape and cabana sanctuary by famed designer Lulu DK, allowing for unapologetic lounging, paired with seasonal cocktails and tunes provided by the resident DJ. Sacred Space - a beach-art installation by renown Bahamian artist Antonius Roberts - completes the experience with a space for soul-stirring reflection on the tip of The Cove peninsula. The sculpture series represents seven dancing women who each reflect the intention of triumph, hope and determination and a vision to help conserve Bahamian heritage (http://www.antoniusroberts.com). 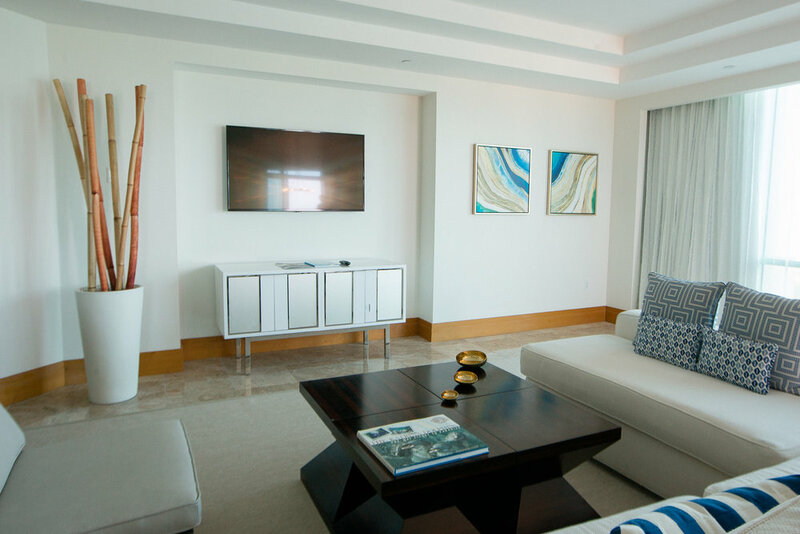 The exclusive 22-story resort has redefined beachside indulgence for the Caribbean. Each of the 600 rooms opens onto an ocean-facing balcony complete with sunken living area and spa-like bathrooms with glass-walled showers and deep soaking freestanding tubs. Another breathtaking, intimate event venue is Ocean’s Edge, which includes an indoor Pavilion that is perfect for a chic lounge-style party, paired with an expansive beach deck offering infinite views of the crystal-blue Bahamian waters. The spacious venue is complete with an ocean-side event lawn that is covered with soft Paspalum grass and outlined with lush landscaping and tropical palms. For us at Cacique, this is an awe-inspiring array of opportunities for one-of-a-kind experiences and events. THE COVE ATLANTIS | THE WHEN? There is no time like the present, especially in the land of ever-summer. Our temperate climate is felt year-round. The most pleasant of times are between October and May when the temperatures are in the mid seventies. March is a delightful month with the perfect combination of winter breezes and summer sunshine! The Cove Atlantis. Wish you were here? THE COVE ATLANTIS | THE HOW? The Cove Atlantis is a colorful drive from Nassau’s International Airport (LPIA). LPIA is accessible from varying major airports throughout the US and receives a direct British Airways flight from London Heathrow. The Cacique team will be delighted to greet you upon arrival and get you there in style.